Another little something to getting more square and ultimately better prints. if your frame is not square, youre not really printing squares but something more along a diamond shape even if so slightly (google a video on Prusa Mesh Leveling). So first check by sliding a ruler in between the 2 bed plates and measuring points (Red Letters) A to A and B to B using the grub screws as a reference (Green Circle) they should have the same measurement. If they are off your lower frame is not square. At this point you may need to remove the top plate and loosen the bearing blocks as you may increase pressure on them as you're squaring things up. If points A are longer than you will need to attach the jig to the front side of the printer (at yellow points A) and slowly tighten the jig until your frame is square. And of course opposite for doing the B side. 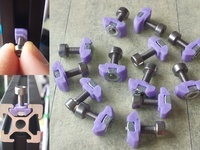 You will need to print the one of each, Mount block, Pull Rod, Pull block. The Mount Block attaches closest to the gantry. and the Pull Block closest to the front. 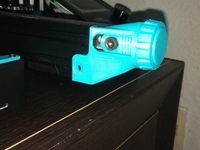 Left or right Pull Block is for which side at your looking face to face with the printer. The Pull Rod is mounted to the Mount Block with the m3x10mm. 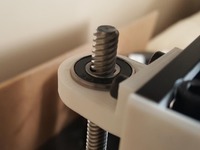 Slide the m3x30mm through the Pull Block and screw a few threads into the Pull Rod. The m3x5mm go into both blocks to clamp on the frame. 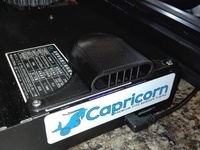 There is Plenty of hole if you need to shorten the Pull Rod to accommodate other mods on your printer.